The new Middle Eastern restaurant at Washtenaw and Hewitt in Ypsilanti, Fattoush Grill, opened in the former Tio’s building back in October. They don’t have a website yet and I couldn’t find a menu online so I picked up a carryout menu a couple of weeks ago. Yesterday I ordered the meat shawarma (slow-roasted shaved marinated lamb pieces) lunch combo for take-out. 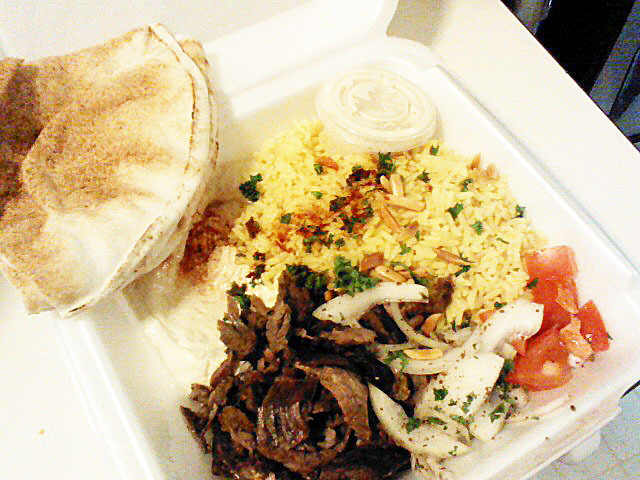 It came with hummous and pita bread, a choice of soup or salad and rice or fries for $6.99. I had the traditional Middle Eastern salad which was very refreshing. The lettuce was impeccably clean and the white onions were crisp and mild. 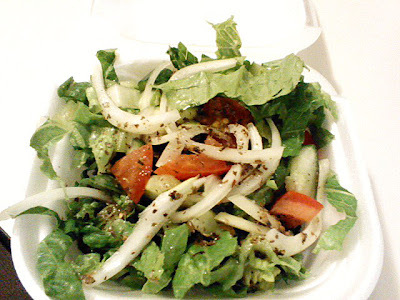 The simple lemon juice and olive oil dressing with herb seasonings was light and delicious. The rice had a few slivers of toasted almonds for a nice crunch. I must say that I absolutely loved Fatthoush Grill’s version of hommous and I am usually not a hummous fan at all. There version is a little different from most Middle Eastern restaurants because they blend the chickpeas with fava beans and tahini sauce for a much smoother texture and it had a great citrusy flavor. The meat was seasoned well and tasted good despite the fact that it was pretty dry. Overall, I really enjoyed the food. I’m hoping that the dry meat was just a fluke this time and I can look forward to more tender meat in the future.